Naming things is a quintessential human activity. By international agreement, a single group, the International Astronomical Union [IAU]has the sole authority to name natural objects in space. The discovererof a celestial object can influence the name, but only within the IAU guidelines. The planets are named for major mythological deities and their moons are named for the deities' attendants. Neptune's moons are the minor sea deities [Triton, Nereid ...] and so on. One slightly offbeat group are the moons of Uranus. Apparently Uranus didn't have any attendants, so Shakespearean heroines and magical beings are used. In conformance with the IAU guidelines, last year two recently discovered moons of Uranus were named Sycorax and Caliban [magical monsters from the Tempest]. Not everything in space has a mythological name. Asteroids can be named after people [Rockerfelleria ...], usually a benefactor of the observatory making the discovery. Some craters on the moon are named after scientists [Tycho, Kepler ...]. The landing site on Mars is named Thomas Mutch Station. Tom Mutch was a Brown University professor closely involved with the Mars missions. Sadly, he died leading an expedition in the Himalayas. Comets are almost always named after their discoverers. Sometimes two people report a comet at almost the same time in which case a hyphenated name is used. Tom Bopp is an amateur astronomer who accompanied some friends to a remote site in Arizona. Using borrowed equipment he saw a faint fuzzy patch. His friends decided the patch was nothing particular, but Tom Bopp reported it as soon as he returned home. Now his name is forever associated with the spectacular comet Hale-Bopp. However, almost no one has ever had the chutzpah to name an entire constellation after himself. The only exception I know is the English king Charles II who renamed Canis Venatici [The Hunting Hounds] after himself. The only remnant of this massive celestial usurpation is the star Cor Caroli [Charles' Heart]. 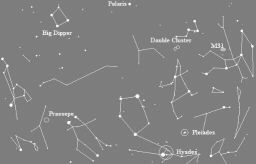 The Hunting dogs can be seen every clear night just under the arc of the Great Bear [Ursa Major; The Big Dipper]. Santa brought me a "rich field" telescope. Instead of magnifying a small area greatly, rich field scopes provide wide angle views at modest magnifications. With it, I've been getting reacquainted with some wide area celestial objects. I'd like to recommend several of these objects to you. A pair of binoculars will work quite well on them. Taurus (the V shaped constellation near the bottom of the figure) has two wonderful open star clusters. Surrounding the very bright orange-red star Aldebaran is the cluster called the Hyades. To the upper right of the Bull's Head is a compact cluster of six or seven stars called the Pleiades. The Pleiades are often confused with the Little Dipper. These six or seven stars become as many as a hundred when viewed through binoculars. Most of the stars in the Pleiades formed at the same time from a single cloud of hydrogen and helium gas. To the east is the very dim constellation Cancer (the Crab). By far and away the most spectacular item in this constellation is Praesepe ( the Beehive). Praesepe is a spectacular swarm of stars when viewed through binoculars. The double cluster in Perseus is another spectacular wide field object. Look for it between the head of Perseus and the distorted W of Cassiopia. You can easily spot these clusters by eye. Nearby is the Great Galaxy in Andromeda - M31. M31 is the farthest object visible to the naked eye. It appears as a faint fuzzy patch. With binoculars on a very dark night, you can make out a faint halo surrounding the brighter fuzzy core. Surprisingly, M31 spans a sky area larger than the Moon when the halo is visible. We can help you locate these objects if you come over to Frosty Drew Observatory this winter.